Have about 22 draft posts sitting in my WordPress Post box, so a bit of catch-up in next week or two to clear some out! Outside of the talk of what ‘transmedia’ actually is, the next key topic of controversy is how can you make money from it vs spending marketing money ‘on it’ to promote a traditional product/project. The Holy Grail at the moment is can we make the ‘multi platform, transmedia form’ an entertainment or service necessity – something worth users putting hands in pockets for (or clicking that PayPal button) and something worth spending the time and effort immersing yourself in – when there are so many other ‘linear’ fragments to graze on? This post therefore looks briefly at a core aspect of transmedia or experience design that is oft left out of the equation, the user need and how we can map out and create transmedia to meet those needs. Simple concept time. Does your work go beyond short term titillation (think 30 second ad spots, short films, virals or stunt marketing campaigns in shopping malls) and encourage repeat visits over many months? Does it contain intimate, social and group building elements? Is it a trusted, familiar environment to use and take part in? Does it actually work, not fall over, most of the time? Will they be rewarded through the respect of others? While I was constructing these points many moons ago it dawned on me I the similarities with the five levels in Maslow’s Hierachy of Needs which as you know was a paper from 1943 and book in 1954 looking at how we are motivated and what basic needs have to be fulfilled ‘before’ we can attain higher levels of engagement with ourselves and others. His work has already been used in marketing areas such as Transpersonal Business (a new area using psychology to develop an understanding of consumer behaviour) and mapped to other emerging areas such as Online Communities by Amy Jo Kim in her 2000 book Community Building on the Web (hat tip Laurel Papworth 2008) or more dry areas such as ‘the internet hierarchy of needs‘. 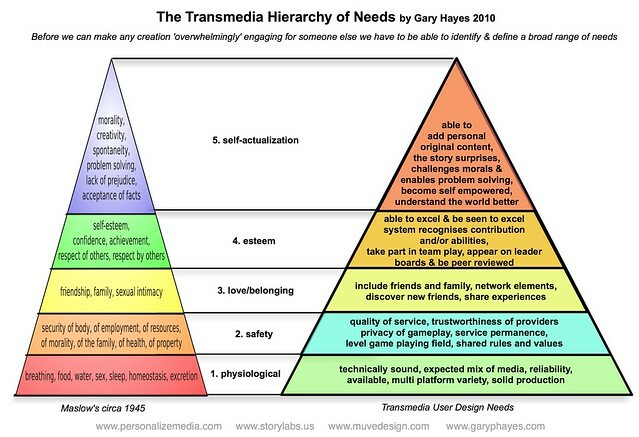 But here I am more interested in how Transmedia Story or Service creation has strong parallels in Maslow’s simple five level diagram, from a ground up user centric, development approach. So designing any transmedia service from a user centric design perspective, the idea in the above draft ‘pyramid’ diagram would be to start at level 1 ‘Physiological’ as a foundation and gradually build and evolve the social, play, story and design/functionality elements – taking into account the next four levels. It implies simply that first you need to have at your disposal a good variety of technically sound platforms with an appropriate mix of reliable media before you build the more sophisticated levels. How many services start at level 3? They go straight for the Facebook and Twitter network storytelling without solid user hub sites, or technically strong subscriber management or well thought out game or story. How many projects start at the top level? Linear and mostly one way broadcast forms, strong on story & morality but without any of the below social, multi faceted and play levels that draw users into long term, personal engagement? Here is the text version for the ‘copy, paste’rs’ amoungst us 🙂 Please note this is a first draft and will probably be embellished! I have covered the concepts of each of those levels on many previous posts (eg: Producing Transmedia Stories and 1999 presentations such as Cross Media Design) and sure the mapping concepts here are not rocket science or particularly jaw dropping, but if you buy into Maslow’s Hierarchy and particularly the ‘level’ and evolution aspects, you really need to consider how those layered needs map across to your field whatever that may be? Transmedia, communities, education, marketing, public services, politics, social media and on.